Sand, silt and clay particles are the primary mineral building blocks of soil. Soil structure is the combination or arrangement of primary soil particles into aggregates. 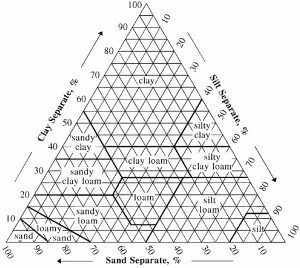 Using aggregate size, shape and distinctness as the basis for classes, types and grades, respectively, soil structure describes the manner in which soil particles are aggregated. Soil structure affects water and air movement through soil, greatly influencing soil’s ability to sustain life and perform other vital soil functions. Soil pores exist between and within aggregates and are occupied by water and air. Macropores are large soil pores, usually between aggregates, that are generally greater than 0.08 mm in diameter. Macropores drain freely by gravity and allow easy movement of water and air. They provide habitat for soil organisms and plant roots can grow into them. With diameters less than 0.08 mm, micropores are small soil pores usually found within structural aggregates. Suction is required to remove water from micropores. Important soil functions related to soil structure are sustaining biological productivity, regulating and partitioning water and solute flow, and cycling and storing nutrients. Soil structure and macropores are vital to each of these functions based on their influence on water and air exchange, plant root exploration and habitat for soil organisms. Granular structure is typically associated with surface soils, particularly those with high organic matter. Granular structure is characterized by loosely packed, crumbly soil aggregates and an interconnected network of macropores that allow rapid infiltration and promote biological productivity. Structure and pore space of subsurface layers affects drainage, aeration, and root penetration. Platy structure is often indicative of compaction. 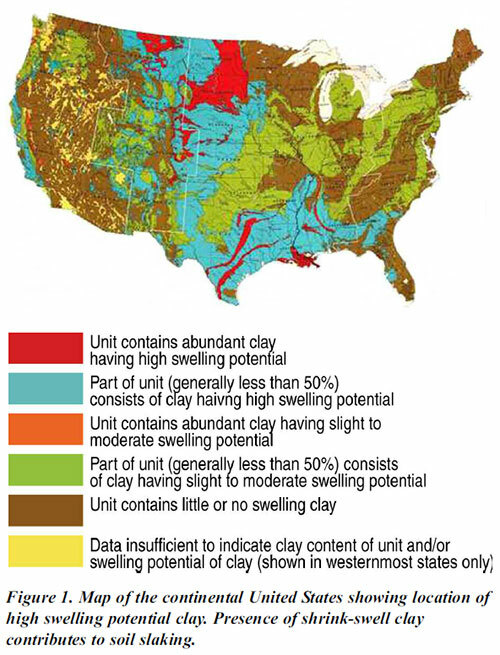 Clay soils with poor structure and reduced infiltration may experience runoff, erosion, and surface crusting. On-site impacts include erosion-induced nutrient and soil loss and poor germination and seedling emergence due to crusted soil. Off-site impacts include reduced quality of receiving waters due to turbidity, sedimentation and nutrient enrichment. Water entry into a sandy soil can be rapid, but subsurface drainage of sandy soils with poor structure can also be rapid such that the soil cannot hold water needed for plant growth or biological habitat. Practices that provide soil cover, protect or result in accumulation of organic matter, maintain healthy plants, and avoid compaction improve soil structure and increase macropores. Soil aggregates are groups of soil particles that bind to each other more strongly than to adjacent particles. Aggregate stability refers to the ability of soil aggregates to resist disintegration when disruptive forces associated with tillage and water or wind erosion are applied. Wet aggregate stability suggests how well a soil can resist raindrop impact and water erosion, while size distribution of dry aggregates can be used to predict resistance to abrasion and wind erosion. Changes in aggregate stability may serve as early indicators of recovery or degradation of soils. Aggregate stability is an indicator of organic matter content, biological activity, and nutrient cycling in soil. Generally, the particles in small aggregates (<0.25 mm) are bound by older and more stable forms of organic matter. Microbial decomposition of fresh organic matter releases products (that are less stable) that bind small aggregates into large aggregates (>2-5 mm). These large aggregates are more sensitive to management effects on organic matter, serving as a better indicator of changes in soil quality. Greater amounts of stable aggregates suggest better soil quality.When the proportion of large to small aggregates increases,soil quality generally increases. Stable aggregates can also provide a large range in pore space, including small pores within and large pores between aggregates. Pore space is essential for air and water entry into soil, and for air, water, nutrient, and biota movement within soil. Large pores associated with large, stable aggregates favor high infiltration rates and appropriate aeration for plant growth. Pore space also provides zones of weakness for root growth and penetration. Aggregate stability is critical for infiltration, root growth, and resistance to water and wind erosion. Unstable aggregates disintegrate during rainstorms. Dispersed soil particles fill surface pores and a hard physical crust can develop when the soil dries. Infiltration is reduced, which can result in increased runoff and water erosion, and reduced water available in the soil for plant growth. A physical crust can also restrict seedling emergence. Wind normally detaches only loosely held particles on the soil surface, but as blowing soil particles are accelerated by the wind they hit bare soil with sufficient energy to break additional particles loose from weakly aggregated soil. This action increases the number of particles that can be picked up by the wind and abrade a physically-unprotected soil surface. Using pesticides harmful to beneficial soil microorganisms. Practices that keep soil covered physically protect it from erosive forces that disrupt aggregation, while also building organic matter. Any practice that increases soil organic matter, and consequently biological activity, improves aggregate stability. However, it can take several growing seasons or years for significant organic matter gains. In contrast, management activities that disturb soil and leave it bare can result in a rapid decline in soil organic matter, biological activity and aggregate stability. Aggregates form readily in soil receiving organic amendments, such as manure. They also form readily where cover and green manure crops and pasture and forage crops are grown, and where residue management and/or reduced tillage methods are used. Improving aggregate stability on cropland typically involves cover and green manure crops, residue management, sod-based rotations, and decreased tillage and soil disturbance. 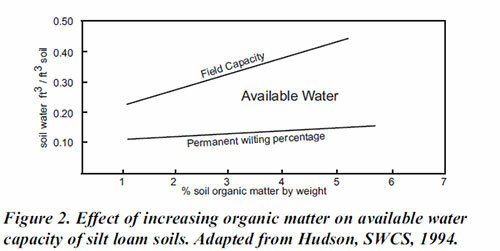 Aggregate stability declines rapidly in soil planted to a clean-tilled crop. Pasture and forage plants have dense, fibrous root systems that contribute organic matter and encourage microbial activity. However, grazing and fertility must be managed to maintain stands and prevent development of bare areas or sparse vegetation. Bulk density is an indicator of soil compaction. It is calculated as the dry weight of soil divided by its volume. This volume includes the volume of soil particles and the volume of pores among soil particles. Bulk density is typically expressed in g/cm3. Bulk density reflects the soil’s ability to function for structural support, water and solute movement, and soil aeration. Bulk densities above thresholds in Table 1 indicate impaired function. Bulk density is also used to convert between weight and volume of soil. It is used to express soil physical, chemical and biological measurements on a volumetric basis for soil quality assessment and comparisons between management systems. This increases the validity of comparisons by removing error associated with differences in soil density at time of sampling. High bulk density is an indicator of low soil porosity and soil compaction. It may cause restrictions to root growth, and poor movement of air and water through the soil. Compaction can result in shallow plant rooting and poor plant growth, influencing crop yield and reducing vegetative cover available to protect soil from erosion. By reducing water infiltration into the soil, compaction can lead to increased runoff and erosion from sloping land or waterlogged soils in flatter areas. In general, some soil compaction to restrict water movement through the soil profile is beneficial under arid conditions, but under humid conditions compaction decreases yields. Using heavy equipment for building site preparation or land smoothing and leveling. Any practice that improves soil structure decreases bulk density; however, in some cases these improvements may only be temporary. For example, tillage at the beginning of the growing season temporarily decreases bulk density and disturbs compacted soil layers, but subsequent trips across the field by farm equipment, rainfall events, animals, and other disturbance activities can recompact soil. On cropland, long-term solutions to bulk density and soil compaction problems revolve around decreasing soil disturbance and increasing soil organic matter. 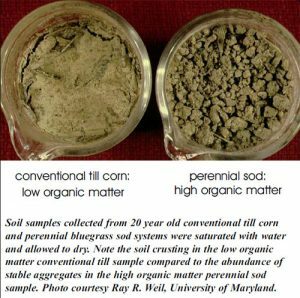 A system that uses cover crops, crop residues, perennial sod, and/or reduced tillage results in increased soil organic matter, less disturbance and reduced bulk density. Additionally, the use of multi-crop systems involving plants with different rooting depths can help break up compacted soil layers. 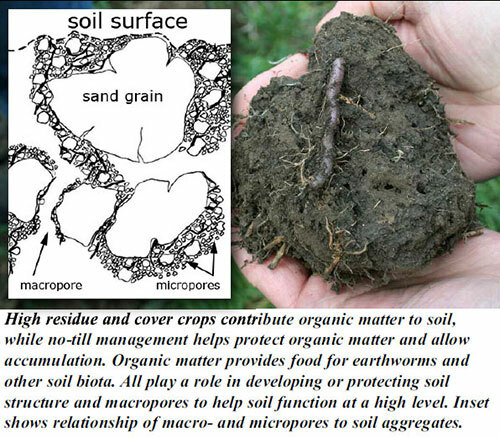 Use practices that maintain or increase soil organic matter. Grazing systems that minimize livestock traffic and loafing, provide protected heavy use areas, and adhere to recommended minimum grazing heights reduce bulk density by preventing compaction and providing soil cover. Available water capacity is the maximum amount of plant available water a soil can provide. It is an indicator of a soil’s ability to retain water and make it sufficiently available for plant use. 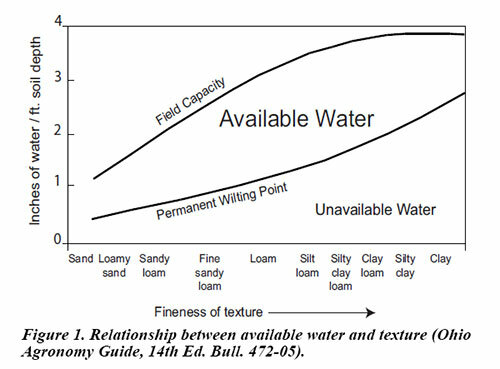 Available water capacity is the water held in soil between its field capacity and permanent wilting point. Field capacity is the water remaining in a soil after it has been thoroughly saturated and allowed to drain freely, usually for one to two days. Permanent wilting point is the moisture content of a soil at which plants wilt and fail to recover when supplied with sufficient moisture. Water capacity is usually expressed as a volume fraction or percentage, or as a depth (in or cm). precipitation, the amount of water held by the soil may be critical. Water held in the soil may be necessary to sustain plants between rainfall or irrigation events. By holding water for future use, soil buffers the plant – root environment against periods of water deficit. Available water capacity is used to develop water budgets, predict susceptibility to drought, design and operate irrigation systems, design drainage systems, protect water resources, and predict yields. Lack of available water reduces root and plant growth, and it can lead to plant death if sufficient moisture is not provided before a plant permanently wilts. A soil’s ability to function for water storage also influences runoff and nutrient leaching. Grazing systems that allow development of livestock loafing areas and livestock trails. As natural areas are permanently converted to homes, roads, and parking areas, the overall amount of water that can be stored in the soil is reduced. This leads to higher total runoff, increased pressure on storm water drainage systems, a higher likelihood of flooding, and generally poorer water quality in streams and lakes. Farmers can grow high residue crops, perennial sod and cover crops, reduce soil disturbing activities, and manage residue to protect and increase soil organic matter to make improvements in a soil’s available water capacity. When feasible, tillage, harvest, and other farming operations requiring heavy equipment can be avoided when the soil is wet to minimize compaction; and compacted layers can be ripped to break them and expand the depth of the soil available for root growth. For soil high in soluble salts, management activities that maintain salts below the root zone can be used. These include irrigation to leach salts below the root zone and practices that promote infiltration, reduce evaporation, minimize disturbance, manage residue, and prevent mixing of salt-laden lower soil layers with surface layers. Developers can incorporate the use of permeable parking areas, green roofs, and other practices that minimize the impact of development on soil water storage. Infiltration is the downward entry of water into the soil. The velocity at which water enters the soil is infiltration rate. Infiltration rate is typically expressed in inches per hour. Water from rainfall or irrigation must first enter the soil for it to be of value. Infiltration is an indicator of the soil’s ability to allow water movement into and through the soil profile. Soil temporarily stores water, making it available for root uptake, plant growth and habitat for soil organisms. When water is supplied at a rate that exceeds the soil’s infiltration capacity, it moves downslope as runoff on sloping land or ponds on the surface of level land. When runoff occurs on bare or poorly vegetated soil, erosion takes place. Runoff carries nutrients, chemicals, and soil with it, resulting in decreased soil productivity, off-site sedimentation of water bodies and diminished water quality. Sedimentation decreases storage capacity of reservoirs and streams and can lead to flooding. Restricted infiltration and ponding of water on the soil surface results in poor soil aeration, which leads to poor root function and plant growth, as well as reduced nutrient availability and cycling by soil organisms. Ponding and soil saturation decreases soil strength, destroys soil structure, increases detachment of soil particles, and makes soil more erodible. On the soil surface rather than in the soil profile, ponded water is subject to increased evaporation, which leads to decreased water available for plant growth. A high infiltration rate is generally desirable for plant growth and the environment. In some cases, soils that have unrestricted water movement through their profile can contribute to environmental concerns if misapplied nutrients and chemicals reach groundwater and surface water resources via subsurface flow. soils, that cause compaction and reduced porosity. 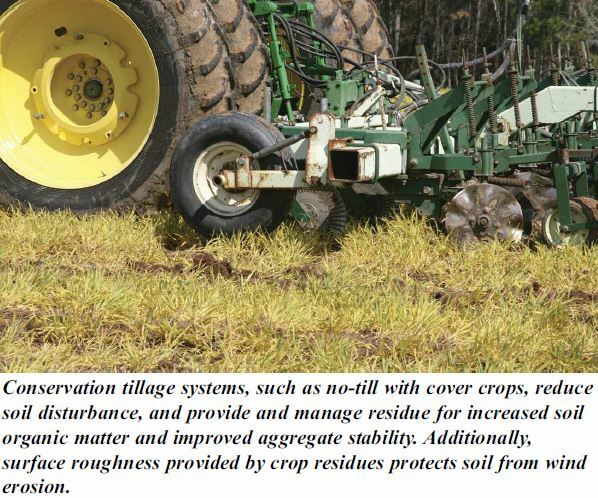 Several conservation practices help maintain or improve water infiltration into soil by increasing vegetative cover, managing crop residues, and increasing soil organic matter. Generally, these practices minimize soil disturbance and compaction, protect soil from erosion, and encourage the development of good soil structure and continuous pore space. 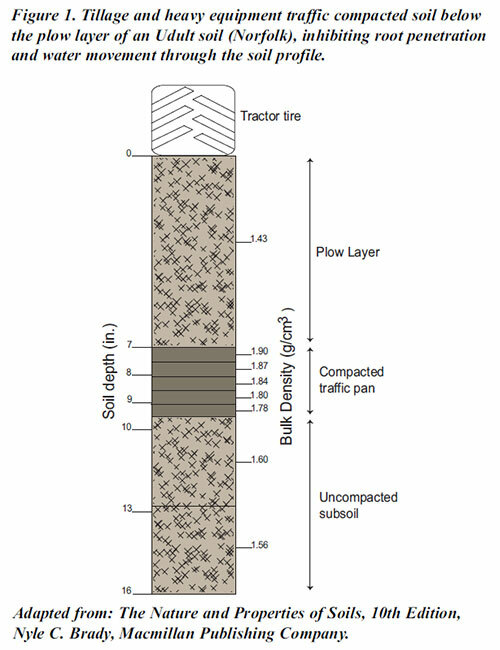 As a short-term solution to poor infiltration, surface crusts can be disrupted with a rotary hoe or row cultivator and plow plans or other compacted layers can be broken using deep tillage. Long-term solutions for maintaining or improving infiltration include practices that increase soil organic matter and aggregation, and reduce soil disturbance and compaction. High residue crops, such as corn and small grains, perennial sod, and cover crops protect the soil surface from erosion and increase soil organic matter when reduced tillage methods that maintain surface cover are used to plant the following crop. Application of animal manure also helps to increase soil organic matter. Increased organic matter results in increased aggregation and improved soil structure leading to improved infiltration rates. Conservation tillage, reduced soil disturbance, and reducing the number of trips across a field necessary to produce a crop help leave continuous pore spaces intact and minimize the opportunity for soil compaction. Slaking is the breakdown of large, air-dry soil aggregates (>2-5 mm) into smaller sized microaggregates (<0.25 mm) when they are suddenly immersed in water. Slaking occurs when aggregates are not strong enough to withstand internal stresses caused by rapid water uptake. Internal stresses result from differential swelling of clay particles, trapped and escaping air in soil pores, rapid release of heat during wetting, and the mechanical action of moving water. In contrast to slaking, tests for aggregate stability measure how well soil withstands external destructive forces, such as the splashing impact of raindrops. Both poor aggregate stability and slaking result in detached soil particles that settle into pores, and cause surface sealing, reduced infiltration and plant available water, and increased runoff and erosion. Slaking indicates the stability of soil aggregates, resistance to erosion and suggests how well soil can maintain its structure to provide water and air for plants and soil biota when it is rapidly wetted. 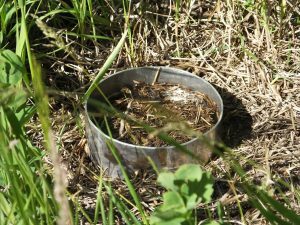 Limited slaking suggests that organic matter is present in soil to help bind soil particles and microaggregates into larger, stable aggregates. Slaked soil particles block soil pores, form a soil crust, reduce infiltration and water movement through soil, and increase runoff and erosion. Small aggregates produced by slaking settle together resulting in smaller pore spaces than where present with larger aggregates. Pore volume may be reduced and the ability of plants to use water stored in pore spaces may be altered. organic matter and promote aggregation. 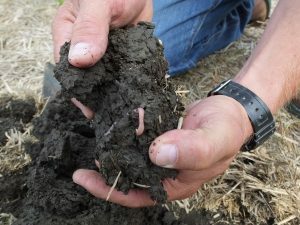 Conservation tillage systems, such as no-till, reduce slaking by reducing soil disturbing activities that break aggregates apart and accelerate decomposition of organic matter. 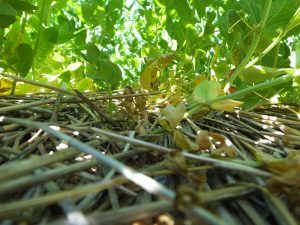 No-till and residue management lead to increased soil organic matter and improved aggregate stability and soil structure, particularly when cover crops or sod-based rotations provide an additional source of residue.